What is your cholesterol? If the last time you checked it for more than six years ago, and then everything was ok, do not relax. The level of the substance that may cause blockage of blood vessels often grow with age. Cardiologists recommend people over 20 years old to check the level of cholesterol in the blood at least once every five years. And if a person is at risk for heart disease, then more often. If your total cholesterol in the blood exceeds 200 or low-density lipoprotein (LDL, the "bad" cholesterol) less than 100, you need to take care of his decline. It's not as difficult as it may seem. Some lifestyle changes and, if necessary, medication can quickly lower cholesterol. So, you know, you should lower your cholesterol ... but to what value? The answer to this question depends on several factors - whether you or your family heart disease, if you go at risk for factors such as overweight, high blood pressure, diabetes and smoking. If the risk is high, the doctors recommend to lower LDL to 70. If the risk is average, the normal level is 130. If the risk is low, the level should be below 160. Recently, doctors are trying to start prevention as early as possible, especially if a person has two or more risk factors. Changes in lifestyle will benefit all who elevated levels of cholesterol. But if you have a high risk of cardiovascular disease, you may want to take medication to lower cholesterol - check with your doctor. 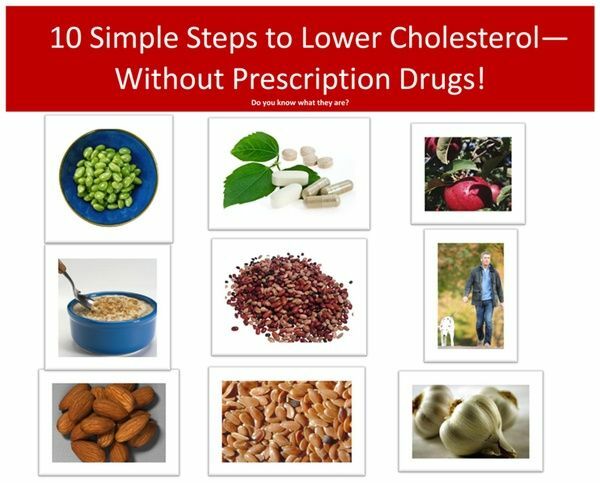 Medications can quickly reduce cholesterol that does not negate the need for a healthy lifestyle. There are several types of drugs that lower cholesterol, such as niacin, resins, fibrates, but the most commonly prescribed statins. They lower the level of cholesterol by 20-50%. Regular exercise not only reduce the level of "bad" cholesterol, but also can increase the "good" cholesterol by 10%. To do this, fit and moderate exercise, such as brisk walking. Some doctors recommend daily walk after dinner. Another option - buy a pedometer and set a goal to take 10,000 steps per day. If you have a sedentary job, every hour is interrupted for five minutes and drive. Whatever kind of exercise you choose, the main thing - the regularity. If you can not engage in seven days a week and do exercises at least five days out of seven. Vegetables, fruits, whole grains - not only sources of heart-healthy antioxidants , but also dietary fiber, which reduces cholesterol. Especially useful for lowering cholesterol soluble fiber. Its effect on the digestive tract can be compared to a sponge, absorbing cholesterol. Sources of soluble fiber, beans, oatmeal, barley. Fish and fish oils contain omega-3 fatty acids, cholesterol lowering. Benefits of nutritional supplements containing fish oil, proven by numerous studies. Fish oil is safe, but you should consult with your doctor if you are taking means reducing blood clotting. Experts recommend eating fish two or three times a week. Best consumed salmon, it most omega-3. But even canned tuna useful. Fish is the most valuable source of omega-3 fatty acids, but fish oil supplements as too useful. Plant sources of omega-3 - soybeans, canola, flaxseed, walnuts, but the fatty acids contained in fish useful. Moderate alcohol consumption may increase the levels of "good" cholesterol by 10%. Reasonably considered one serving per day for women, two - for men. But considering all the risks associated with excessive alcohol consumption, experts do not recommend increasing the intake or starting to drink if you are not used to drinking alcohol. Instead of sugary carbonated drinks, drink green tea. Studies have shown that substances in green tea help reduce "bad" cholesterol. In a recent study, people who took green tea extract, have reduced LDL cholesterol by 4.5%. Studies show that regular consumption of nuts leads to a moderate reduction in cholesterol levels. Especially useful walnuts and almonds . Nuts but high-calorie foods, do not eat more than one handful per day. Instead of butter, use spreads enriched with stanols - these phytochemicals reduce cholesterol.